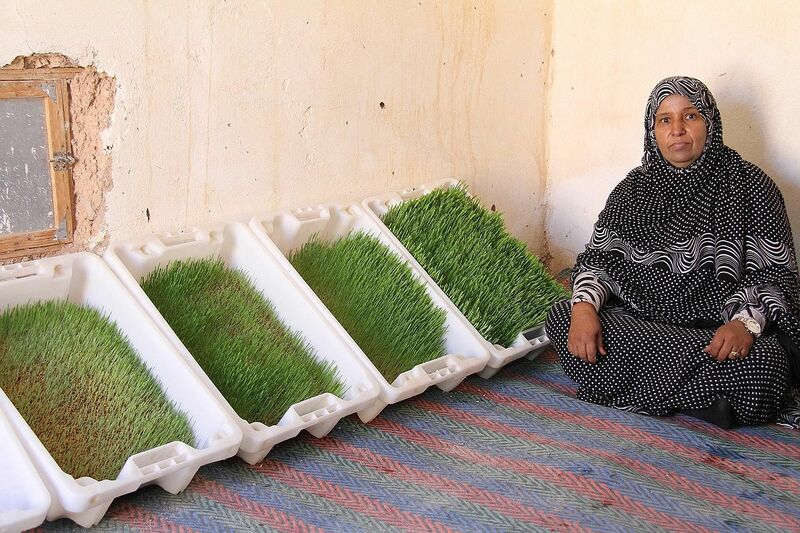 Growing fodder in the Sahara? No kidding! ALGERIA • The United Nations World Food Programme (WFP) has set up green fodder production units in refugee camps at Tindouf, south-western Algeria. These rely on hydroponic agriculture, which means plants are grown on a material that is naturally inert, such as sand. The method has proven to be effective in the arid Saharan climate. The plants need only water to grow, with neither soil nor fertiliser required. Designed by Sahrawi engineer Taleb Brahim, the project was launched with funding from German and Canadian sources. Mr Brahim, himself a resident of the camps, had his idea selected at the WFP Innovation Accelerator boot camp in Munich, Germany, last year. The units were then set up in Tindouf. In the pilot phase, 50 units were installed. Each one can produce up to 15kg of fodder per day, which is sufficient for five goats. The scheme benefits 300 families. One of the beneficiaries said: "I was given a unit that's adequate for my five goats, and also given training. After about a week, enough fodder grew, and my goats are now healthier." Weight in kilograms of fodder produced a day by each unit, sufficient to feed five goats. Algerian company Agro Solution, which has partnered the WFP, is producing another 170 units, which will be operational this September. Mr Romain Sirois, the WFP representative in Algeria, said: "With a population of 173,600 refugees in five camps, there's potential to further develop the project."